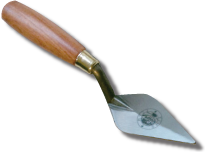 The "tool of the trade" for those involved in archaeology, whether amateur or professional. These earrings replicating the pointing trowels used by archaeologists are in sterling silver with beech wood handles. Presented in beautiful blue / gold embossed Time Team gift box.